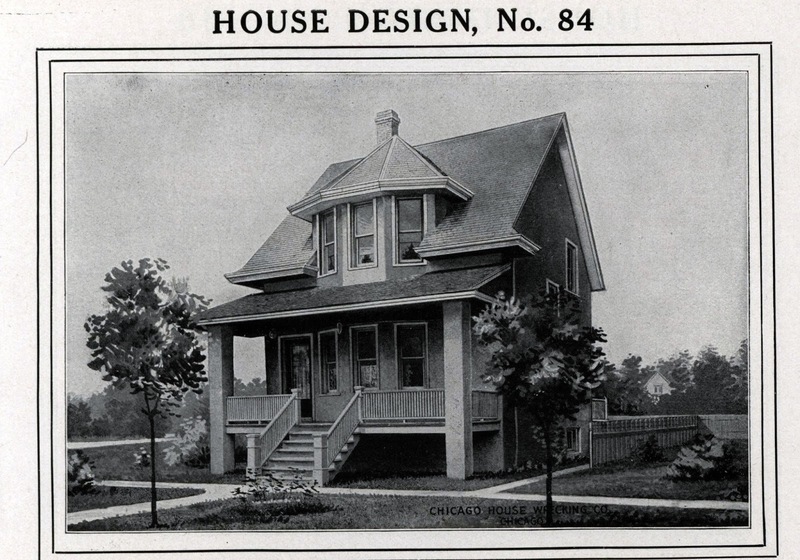 The Chicago House Wrecking Company began selling house plans and building materials in 1907. They later changed their name to Harris Brothers, and the company sold many houses in the Chicago area and nationwide. One of the most popular models sold by the Chicago House Wrecking Company was No. 84. It was first sold in 1909 and heavily advertised in national magazines and in newspapers from Washington DC to San Francisco. Chicago House Wrecking Company ad from 1911 that featured the No. 84. The No. 84 is identified by the bay windows on the first and second floors and the shed dormer over the porch. There are two identical No. 84 models side-by-side in Maywood. 1318 S. 7th Avenue, Maywood. 1310 S. 7th Avenue, Maywood. Chicago House Wrecking Company No. 84, from the 1910 catalog. Author Rebecca Hunter has these homes misidentified as Sears Modern Home No. 190 (sold from 1911-1914). 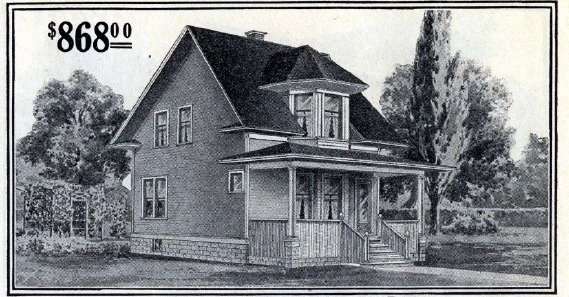 Sears No, 190 from the 1914 Modern Homes catalog. The Sears No. 190 and the Chicago House Wrecking Company No. 84 have identical interior floor plans and exterior dimensions. The differences between the models are seen with the front porches. The porch of the Sears No. 190. It is a hipped porch roof and has three skinny posts holding it up. The porch of the Chicago House Wrecking Company No. 84. It is a shed porch roof and two thick posts holding it up. Note the triangle seen on the side of the porch roof. 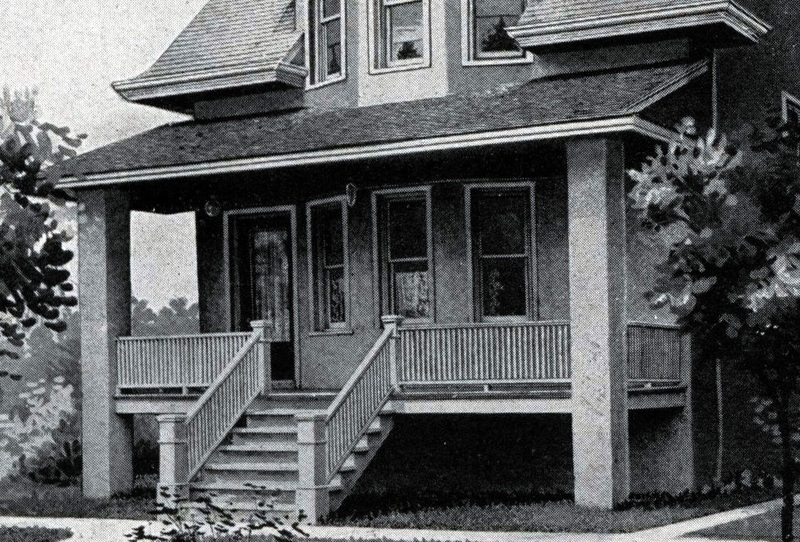 The porch of the house at 1310 S. 7th matches that of the No. 84. These homes were built around 1912, probably by a contractor. At that time, the Chicago Aurora and Elgin Railroad ran literally next to these homes, and the station was two blocks away. 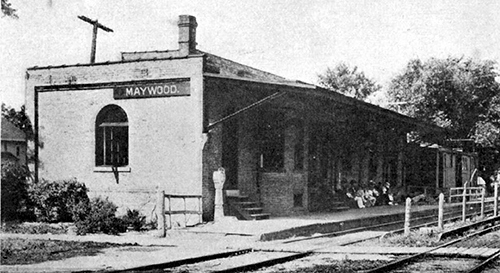 The CA&E station on 5th Avenue in the early 1900's. Photo courtesy of GreatThirdRail.org. The original owner of 1318 S. 7th was Elizabeth Baldwin. She was a salesperson for a department store, according to the census. She owned the house until 1920. The original owners of 1310 S. 7th were Dr. Elmer J. Bartholomew, an osteopathic physician, and his wife, Mary. Elmer died in 1919, and Mary supported herself by working as a dressmaker and taking in boarders. 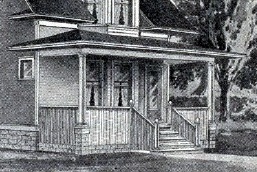 Mary lived in the house until 1950. In 2013, the house (then used as a two-flat) was gutted by a developer and converted to a single family home (there is literally nothing original left inside). This was not great for the house, but a positive sign for Maywood. A few years ago this neighborhood was home to the Gangster Disciples, so house flippers are a welcome development. I think this post is very important for researchers, to bring to light the slight difference between these two houses -- but that slight difference makes the I.D.! It's very interesting to read about the folks who originally lived in these houses, too. I referenced your post (and also brought up the 190 clone by Chicago Millwork Supply Company), in my latest blog post about a Radford design that also had this centered front turret-style dormer.